In the Spring of 2007, I graduated from Murray State University in Western Kentucky. 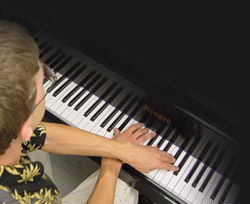 I received a Bachelors of Science degree in music with emphasis on Piano. I first entered as an electronic media major, but the program didn't seem to offer what interested me the most, which was studio recording and non-linear music editing. Although I did still enjoy plenty of free time to record and edit my own compositions, most of my academic requirements involved purely composing and performing. Videos of my compositions may be viewed [here].